Marko Pecarski (Serbia), Filip Petrusev (Serbia), Nikola Zizic (Montenegro) and Arturs Kurucs (Latvia) are some of the biggest names at the TBF U16 International Tournament in Samsun. Turkey love their hoops and the TBF’s commitment to youth ball continues with the TBF International U16 Men’s Basketball Tournament, taking place on the shores of the Black Sea in Samsun – site of this summer’s U18 European Championship. Twelve teams – 11 of them from Europe and two of them being Turkey sides – will battle from January 30 to February 6 at the Mustafa Dagistanli Sport Hall and Atatürk Sport Hall. Every game will be broadcast live on TBFtv.org. The teams will be broken down into two groups with Bulgaria, Germany, Latvia, Lithuania, Slovenia and Turkey’s U16 national team in Group A and Argentina, France, Montenegro, Serbia, Ukraine and Turkey’s U15 national team in Group B. Group play runs from Saturday January 30 to Wednesday Feb 3. After a day of rest on February 4, the top two finishers in each group will face off in the semi-finals on Friday February 5. And the final is scheduled for 1800 local time on Saturday February 6. This piece is a preview of sorts – almost more of a list of some of the guys to watch in the tournament. It’s kind of background piece for those going into this tournament knowing next to nothing going in. Here is a breakdown of some of the information about the teams – listed in alphabetical order. The leader of this team will be Francisco Caffaro, a 2.07m big man who helped Argentina as an underage player qualify for the 2016 FIBA U17 World Championship. Caffaro could be the starting center for Argentina in Spain. Juan Ignacio Marcos and Juan De La Fuente also have chances to make the U17 team. Another important guy will be Francisco Farabello. One name you might recognise is Tomas Wolkowisky, the son of Ruben Wolkowisky who is considered one of the more complete players on the team. One of the only names that stands out is Tsvetomir Chernokozev, who played for Bulgaria last summer at the U16 European Championship Division B at a year younger. Unfortunately one of the best players from the 2000 class will not be in Samsun for France, who will be without Sekou Doumbouya – the talented youngster who had a big coming out party for INSEP at the Adidas Next Generation Tournament in Kaunas. Johan Randriamananjara and Joel Ayai were both on the INSEP roster in Kaunas but didn’t play that much. Another name to watch is Yohan Choupas. Germany continue to produce interesting players and perhaps the most intriguing is Maximilian Begue, who is listed at 1.89m and has enormous talent – despite being 2001 born. Begue is just the latest example of Fraport Skyliners ability to produce great players, collecting four double-doubles in the U16 JBBL league. A name some people will know is Henrik Drescher, who played at last summer’s U16 European Championship. He will also play for Alba Berlin at the Belgrade ANGT. Berlin have an interesting big man in 2.05m Joshua Lübken. International Basketball Academy Munich’s Bruno Vrcic, Mehmet Uysal of Regnitztal/Brose Baskets Bamberg and Phoenix Hagen’s Marco Hollersbacher all have produced triple-doubles this season in the JBBL. Another name to watch is Tim Köpple of ratiopharm ulm. The biggest name for Latvia will be Arturs Kurucs, who plays for Baskonia in Spain. Kurucs, who is the younger brother of Barcelona’s Rodions Kurucs, also played at the U16 European Championship last summer along wtih Arturs Zagars, Armands Berkis and Gints Zomerfelds. Berkis and Zomerfelds were also on VEF Riga’s squad for the Kaunas ANGT. The only name that stands out immediately is Domantas Vilys. Montenegro will be a loaded group, featuring Nikola Zizic of Barcelona. 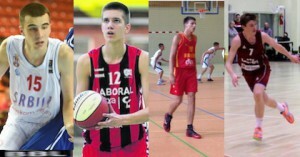 Danilo Brnovic and Igor Drobnjak both played at the U16 European Championship last summer. Both of them are also listed on Buducnost’s ANGT Belgrade team along with teammates Dimitrije Radusinovic, Milos Vujovic and Aldo Alivodic. Serbia probably have two of the top players at this tournament in 2015 U16 European Championship teammates Marko Pecarski and Filip Petrusev. Pecarski helped Mega Leks win the ANGT Rome tournament and reach the ANGT Finals while Petrusev is with Laboral Kuxta in Spain. Matija Jovanovic and Bogdan Rutesic are on Partizan Belgrade’s roster for the ANGT Belgrade while Aleksa Ilic is expected to play for Zeman. Nik Dragan is one of four Slovenian players who played last summer at the U16 European Championship Division B along with Jernej Andolsek Heine, Nemanja Scekic and Blaz Janezic. Dragan also was on Union Olimpija Ljubljana’s roster for the ANGT L’Hospitalet. Ukraine’s team features two players who played at the U16 European Championship Division B last summer in Denys Bachurin and Denys Klevzunyk. The Turkish federation has not yet announced its rosters for the U15 and U16 national teams. Can Petrusev convince Pecarski to join him in Zags country?